The forecasts of a busy Atlantic hurricane season are proving accurate. 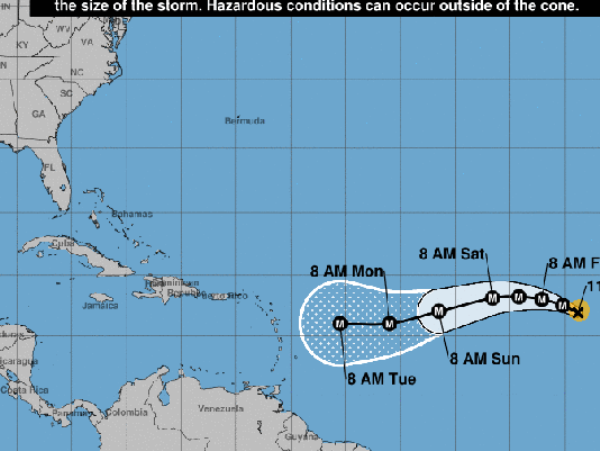 As Harvey weakened to a depression, a new hurricane, Irma, fired up in the central Atlantic Ocean, the National Hurricane Center said Thursday. Irma was located about 1,780 miles east of the Leeward Islands in the Caribbean and was moving to the west-northwest at 12 mph. It poses no immediate threat to land and its eventual track remains highly uncertain as is typical for storms this far out to sea. Irma will take about a week to trek west across the Atlantic Ocean, AccuWeather said. Possibilities range from a landfall on the Leeward Islands in the northeastern Caribbean to the Carolinas and Bermuda — and everything in between, according to AccuWeather. Meanwhile, closer to home, the hurricane center is also watching a separate area of disturbed weather in the western Gulf of Mexico, one that could spin up into a tropical depression or storm in the next five days. And in the eastern Pacific Ocean, Tropical Storm Lidia took aim on Mexico’s Baja Peninsula. As of 5 p.m. ET, Lidia had winds of 65 mph and was located about 20 miles southwest of Cabo San Lucas, Mexico. Tropical storm warnings were in effect for much of the Baja as well as the west coast of Mexico. Lidia is expected to produce total rain accumulations of 8 to 12 inches across the Mexican states of Baja California Sur into Baja California and western Jalisco, with isolated maximum totals of 20 inches. The rains could cause life-threatening flash floods and mudslides.